This past weekend Bethany and I did some freezer cooking. (We've only been talking about doing this for a year). As much as I love meal planning, sometimes life happens and our dinner plans do not work out as, well, planned. Just knowing that I have a few extra meals in our freezer helps to make me feel less stressed. (I'm sorry but you do not get a picture of this meal- I hate raw meat and did not figure you really wanted to see a photo of raw chicken). I think this is great considering there are times when I spend $70 at the grocery store for one week alone! Accomplishing freezer cooking was one item on my resolution list and I am so happy to have it crossed off. I feel so accomplished from this one afternoon of cooking that I am hoping to repeat this again every couple of months. -Don't Panic Dinner is in the Freezer, Freezer Pleasers, What's Cookin Chicago? Have you ever done any freezer cooking? We are trying the pesto chicken stuffed shells tonight! I have not ever done any freezer cooking but it sounds like a genius idea. And I'm lazy, so this would be perfect for me. I totally need to make the freezer breakfast burritos. Maybe I will do that Sunday! Oh and those shells look so good! I have never tried this before but I have heard of it before. This def looks so easy and stress free I must def try this soon!! These are great tips! I've never done freezer cooking, because when I get home at 6:30 every night, I don't always feel like slaving over the stove! 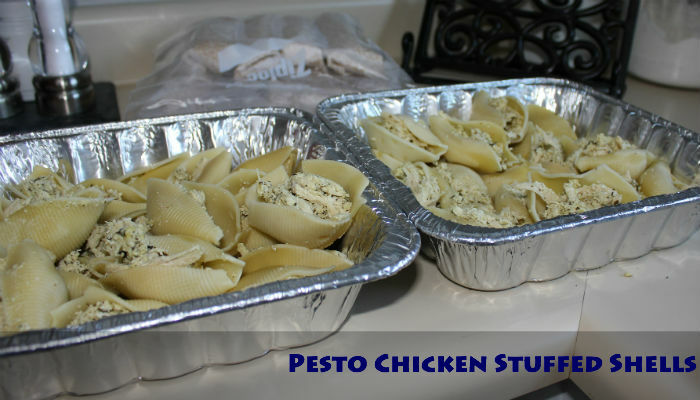 ;) The Pesto Chicken Stuffed Shells really caught my eye...adding this one to my next cooking session. I'm so happy that Lindsey over at Bargain Blonde introduced us to you! We love her blog & we're super excited to catch up on yours. In fact, we're your newest followers. Stop by our blog sometime & please drop us a comment to say "hey!" We'd love to hear from you. I frequently frrezer cook! Some of my favorites are soups, lasagna and quiche. Whenever I make these, I always just double the recipe and freeze half! I definitely need to start doing this, especially since we started going to the gym after work again. This is awesome! What a great idea for those nights when there is no time for dinner! Such a great idea! I need to try this! haha silly boys indeed!! i have never done freezer cooking but your post has inspired me to grab a girlfriend and cook together so we can be prepared wives with meals on hand! What a fun surprise reading this, my friend, Vanda, is one of the authors of Don't Panic It's in the Freezer! (Depending on which one you have, I think I have a few recipes in it.) 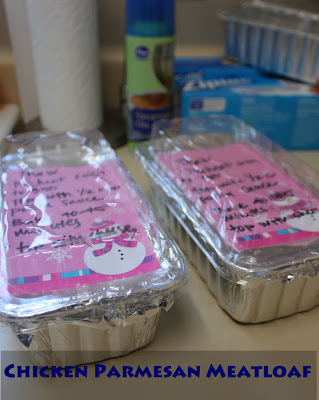 I love the idea of freezing meals - saves so much time & $$! You are seriously so impressive!!! I've never done freezer cooking but your meals sounds fantastic. Maybe I'll give this a try. Hope you have a great weekend! I'm so impressed! Nice job! This is such a smart idea! I need to make the time to do something like this. Thanks for sharing. I have wanted to try freezer cooking FOREVER! Thanks for the inspiration!